What is the name of oldest public libraries in all of the different continents of the world? In what year was the first CD-ROM book released? In what years were the first books printed in French, Thai, Japanese, Arabic and Turkish printed? What are the name of the oldest extant texts or inscriptions written in Chinese, English, Russian, and Spanish? When was the first major computer database used in libraries? What is the title of the largest and smallest and most expensive books ever published? Where in the world is the world's busiest public library? Which famous horror fiction writer worked in a library? What are the names of the very first three books to contain photographs? Where are the tallest bookstores and library buildings in the world? This updated and expanded edition provides over 500 fascinating facts about libraries, periodicals, books and reference databases. The new book is not just a book about library and book comparisons, it is a remarkable story of libraries and books from the earliest times to the present. 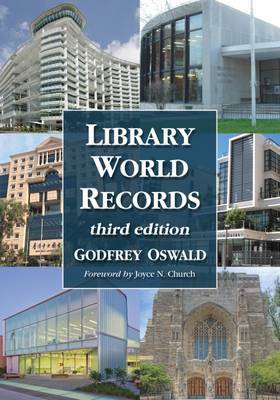 It is best described as a Guinness Book of Records for libraries and books. 35 Twenty-Six Largest University Libraries in the U.S.
37 Ten Largest University Libraries in the U.K.
64 Five Oldest University Libraries in the U.K.
121 Fifty-Seven Translations of the Word "Library"
146 First Books Printed in English in the U.K.
258 First Library OPACs in the U.S.
261 First Public Library OPAC in the U.K.
361 Largest Electronic Trading Services for Libraries in the U.K.
365 First Five University Library Schools in the U.S.
Former librarian and information consultant Godfrey Oswald is also the creator of ""The Info Connect LIS Directory,"" the largest available alphabetical directory on the Internet for librarians. He lives in London, England.